Three coordinated blasts–two in Zaventem Airport and another in the Maelbeek metro station–struck the Belgian capital of Brussels Tuesday morning, March 22. A death toll of thirty-four and climbing clearly classifies this incident as another major attack on European soil, among the general ranks of the attacks in Paris that struck November 2015. Yet such coverage fails to recognize equal life, death, and credence of parallel events sweeping the Middle East. With the Islamic State yet again publicizing claim for this atrocity, many leaders and citizens across Europe, America, and the entire non-Muslim world are again steeping in their rekindling (at best–often, it never just truly dissipates) Islamophobic tendencies. Just ten days ago, a car bomb blast in Ankara, Turkey, left thirty-two dead and over a hundred wounded. A quick skim on Facebook or glance of any news channel between these two days would easily sculpt a stark realization of lacking coverage, at least – or perhaps particularly – in the Unites States. Both this recent Ankara tragedy, in addition to countless other Islamic State-staged nightmares through many nations, especially Turkey, have remained quashed in the dust of other trumping headlines, like those by Mr. Donald himself that reinforce rhetoric of bigotry, hate, and racism. Brussels is not alone. The first-world public sees that. It has the support of nations and news channels flocking to diagnose the story and psychoanalyze yet another barbaric, mindless atrocity by a terrorist organization. Brussels is not alone, in a more critical way, however. And this sphere of company often lapses from deep or widespread first-world concern. 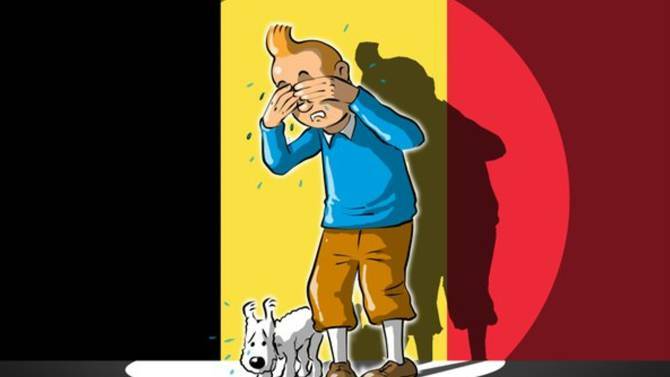 Brussels is not alone. It aches, just like Ankara and Istanbul, Gaza and Syria, Flint and Chicago. Chaos and havoc wreak the world not on occasion, but on the ordinary. The tears of the world should not sob only with those whose cries bellow the loudest. The filtered, throwback social media posts or choice layover flags in solidarity of vacation memories should not erase the images of, especially, toiled soil that has been warzone for too long to ever glimmer to the world or casual travelers in the past decades. Muslim family and friends everywhere cannot be alone. They cannot be abandoned. Hyped media coverage of such atrocious incidents, linked albeit to complete and total extremists needless to say, only spurs Islamophobic attitudes and activity. Allyship, concern, and love will keep family and friends safest–particularly Muslim women who daily don hijab. Arab refugees across Europe cannot be alone. They cannot be abandoned. They have no power in this, but they’ll likely be among the most targeted in the aftermath. ISIS is precisely who they were fleeing, precisely who followed them, and precisely who has calculated their painful backlash for an unwelcoming stay in Europe. Radicals formulate to reel shunned-feeling individuals back by instilling and precipitating Islamophobia in their new homes to accumulate into ostracization –this the the dangerous, vicious, lethal cycle of ISIS and the like. As much as I believe the barbaric terrorism of these groups is the total antithesis of Islam, the idea of religious affiliation cannot be completely written off as a side character or hijacked identity in this conversation. When a radical group claiming responsibility for the attacks also claims to represent a religion, the topic of faith, along with its misappropriation, is inextricable. As a Muslim, I can’t justify Brussels. I can’t justify Ankara. Or Paris. Or Istanbul. Or any strain of terror, allegedly “Muslim” or not. I can’t explain them. Of course I can condemn them, which I obviously do. The fact that this aside even has to exist relays how insecure, unstable, and scared the reality of a Muslim woman even in the US is – perhaps that sounds selfish, perhaps that sounds petty, or perhaps it’s just product of growing up in post 9/11 America. It is frustrating to live in a world where each day is a trudging battle to hang onto words like ‘Muslim’ or ‘Islam’ and constantly reclaim them to live in some strain of true, positive meaning – not the decayed guise of monsters who scream and kill and claim and tarnish and steal these identities – my identity – senselessly. Nor, of course, does terrorism spare any religion. Paying respect to one tragedy while also commemorating another does not marginalize either. Prayers to Belgium, Turkey, and every ache on Earth. Well, more than 90 per cent of victims of terrorism are victims of Islam-inspired terrorism, so maybe there is some empirical relationship between Islam and terrorism? Actually…”According to the FBI, 94% of terrorist attacks carried out in the United States from 1980 to 2005 have been by non-Muslims” so maybe there is some empirical relationship between non-Muslims and terrorism? And according to the National Counter-terrorism Center, “In cases where the religious affiliation of terrorism casualties could be determined, Muslims suffered between 82 and 97% of terrorism-related fatalities over the past five years,” so maybe there is some empirical evidence of terrorism being mostly against Muslims? Please reevaluate the statement you made and what point you were trying to make. Now, now, don’t you challenge them with stats and facts, please Annie. They can’t take the truth! You are wrong. Some 99% of US population is non-muslim, so if only 94% of terrorist attacks have been by non-Muslims it means Muslims are extremely over-represented in terrorist attacks in the US. If the other 6% of terrorist attacks have been carried out by Muslims than they are more than Muslims have been more than 6 times more likely to be terrorists than non-Muslims. So maybe there is some empirical relationship between Muslim and terrorism? I am talking about fatal terrrorism attacs worldwide, which do not leave any doubts they were terrorist attacks, no matter what definition of a terrrorist attacks you, of FBI, use. And as muslims constitute less then 2% of American citizens, being responsible for 6% of terrorist attacs makes them 3 times more prone to be terrrorists, doesn’t it?